As the health of Boomer flickered good and bad, bad to worse, then improving, to— I now have Hope….we had company. My brother and his wife, Cloudy came for a short stay. Boomer felt good enough to be part of most everything. Then the kids came from Battlement Mesa. We went to the lake, of which I would not let Boomer go. Too much activity and way too hot. And who knows how he got this stuff—I want it confined here and to die out here. We had a hay customer arrive wanting 100 bales. Then the day broke forth spreading sunshine and shadows. 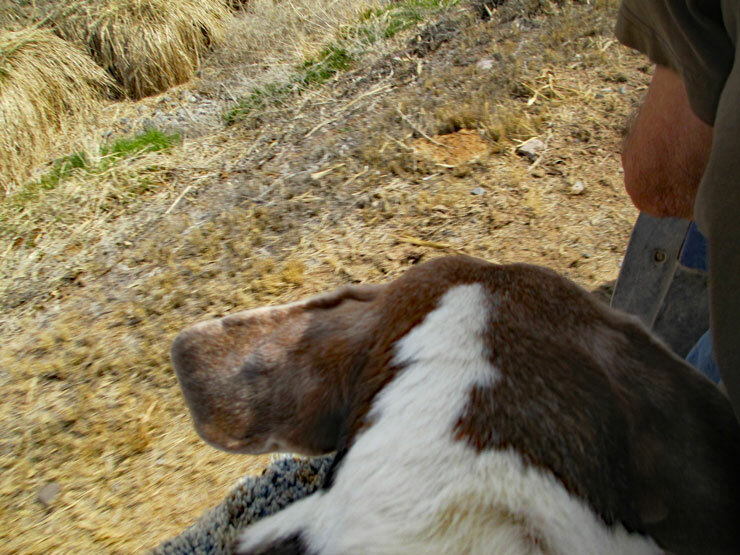 Boomer and I walked a short ways down the farm lane…waving good-bye to our family as they headed back to their home. Gradually, gradually I am seeing Boomer improving. Once more I thank each and everyone of you! This entry was posted in Life on a Colorado Farm and tagged 2017, Beagle, Boomer, company, Hot-Sun-Kissed 106* DayLight---July 6, life on a Colorado farm by Dayphoto. Bookmark the permalink. Thank you. I know what you mean. I am attached to those two cute dogs you have. Family, hay customers and an improving Boomer ~ Sounds good! Did the thermometer really hit 106° over there? :::ugh:::🌞:::hot::: And that’s why your corn looks SO good! Heat, cloudless skies, and water…yep. 106* and supposed to be the same today and tomorrow. Nice family gathering at the lake. Boomer looks better. Keeping him in my prayers “just in case.” Sandy. He still coughs and coughs, but not as much or for a long. Thank you, I appreciate it! I’m with you…I detest winter, so the heat makes me feel good. Thank you for the comments on Boomer. Yes…family and friends it’s always a good thing. I’m glad Boomer was feeling good enough to take part in some of the activities with your family. Instead of just laying there in a semi-coma…Boy am I ever glad. love the picture of boomer in the golden sunset. He is doing way better…I loved it too, so just had to share! That’s a little too hot for any body. I’m glad Boomer is doing better. Hope it continues. Boy, is it ever. 104* at five o’clock yesterday afternoon…more expected today. Oh dear. Hope it cools a little tomorrow. No cool down in sight for a few more days…rain would be nice! Fingers crossed for plain rain and no thunderstorms. Yes! And NO hail! Shudder! Hail is always the first thing hubby things of too. Oh good for the improvement! Boo for the too hot weather. We swelter on…but I’m not complaining…I can be outside and enjoy the sun…winter…bah! That’s the best news I’ve heard all day!! Yay for Boomer getting better. But 106!!! Oh, my no. I don’t think I could take it. I’d be sitting in the fridge. ;( I’ll keep prayers going for Boomer till you say he’s 100%. Life catches you out. My son is autistic,today we went out for a drive. It was lovely all went well. I needed a half bottle of scotch to get over it. Life is tough, best wishes to boomer. My heart goes out to you and to your son. I’m sure the world is HUGE at different points for him! Cyber Hugs to you both! Yes…he is now back to his happy self!